Teaching affects eternity. It really does. Our lives affect eternity but not near as perfectly and precisely, not near as powerfully nor presciently as teaching. I’ve been thinking lately about my own affect – how I stumbled along and began EFL Classroom about 15 years ago just posting up a few resources and thoughts on a free website I built – the BATCAVE. And since then, like a Rube Goldberg machine, one thing led to another, led to another. One thing had an effect that nobody could really predict but somehow through all those effects, one BIG EFFECT did happen. A thread ran through all the pushes, pulls and dispersion of energies. We are so blessed as teachers, to weave such fabric. Almost godlike, we touch the future and keep alight something which we are still searching a name for…. I don’t know what it is but I do know we are a Rube Goldberg machine that gets us there as we butterfly along. Let’s keep touching eternity and keeping the world on its axis. My hats off to all those teachers that daily make this miraculous thing happen. To end or rather abandon this post – here are 2 of my fav. 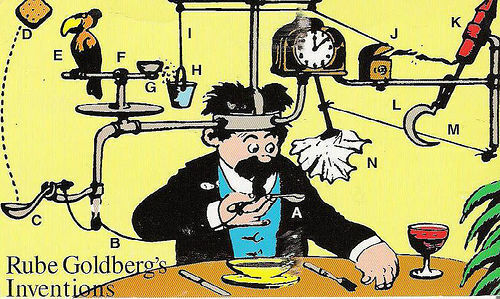 Rube Goldberg videos.